For minions of the Medieval aesthetic, New York Carver offers everything from a photographic field guide to the City's best gargoyles, grotesques, and friezes, to an illustrated lexicon on the subject. 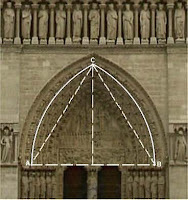 Learn the difference between an apse, cinquefoil and voussoir while studying the lines of Gothic Geometry. And when you've had your fill of all that, find cloistered respite in the virtual Abbey.